Yes Bank was founded by Mr. Rana Kapoor and his highly talented and competent team of professionals in top management. It is India's fifth largest private sector bank and one of the fast growing banks in India. Yes Bank offers many services to their customers. Credits card from Yes Bank is one of the popular services offered by the bank. Applying to Yes Bank credit card is very simple and one can do it online by following some simple steps. It will take hardly five minutes to complete the Yes Bank Credit Card online application process. If you have applied for credit card from Yes Bank and want to check Yes Bank credit card application status online then read more. Step 1: Go to Yes Bank official website by clicking this url - https://www.yesbank.in/. Step 2: On home page you will find various services offered by the bank such as opening an account, various investments, apply for different loans & credit cards and credit card application status. Step 3: At the top right hand side, just below the Yes Bank logo you will find a heading stating 'How May We Help You Today'. Go to the second column under this heading. You will find credit card application status as a 5th list of this second column. Step 6: There are four empty boxes in this page. In the first empty box, below the text 'Mobile Number', enter the same mobile number that you have given while applying for Yes Bank Credit Card online. This field is mandatory. Step 7: In the next two empty boxes you have to enter either application reference number or application form number. This field is also mandatory and you can fill anyone of the details available with you. You will get application form number and application reference number after submitting your credit card application online. 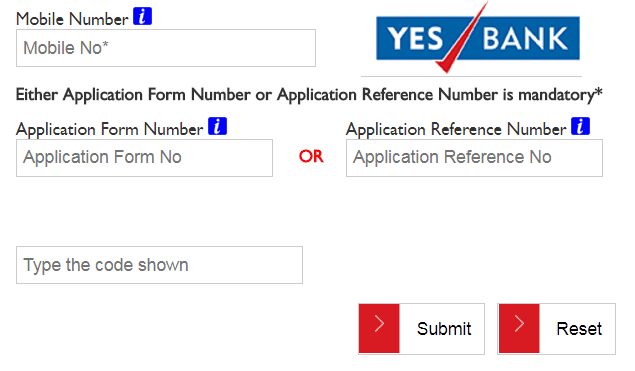 You will get application form number on Yes Bank credit card application form acknowledgement slip. This is a ten digit alphanumeric code. You must have received a 13 digit number on your mobile number as SMS after applying for Yes Bank credit card online. This number is nothing but an application reference number. Step 8: If you have application form number then enter this number in the second empty box, just below the text 'Application Form Number' or if you have application reference number then enter it in the third empty box, just below the text 'Application Reference Number'. Step 9: Type the captcha code in the fourth empty box and click on 'Submit' tab. Step 10: You will get the details about your Yes Bank credit card application status in the next page. Hope this article has helped you in understanding Yes Bank credit card application status enquiry process online. Sir I have applied for Yes credit card . But, 3rd September your customer care call me a phone and about the purpose of verification on my yes credit card. Then after 2 days I received sms stating that, your application nos is 2022901028428 and you will receive update after 11 working days. Then after 3 days i have received a sms starting that you will received upto date after 9 working days so for. Still now, I have not received any message. But, when i have put Track the application number to online, they show me only one message ( Your card is to be going processes.Will you back soon). Kindly inform me, how many day i take the credit card?